Take this enjoyable Tokyo bike tour and see the highlights of Shitamachi. Your guide will lead you at a leisurely pace as you travel from site to site, from Fukagawa-fudo Temple and Tomioka Hachimangu Shrine to Tokyo Skytree. Keep a lookout for a rare chance to sumo wrestlers outside Ryogoko Sumo Stadium and take in the natural landscapes as you ride through the traditional Kiyosumi Japanese Garden. Enjoy personalized attention on this small-group tour, limited to 10 people. Meet your guide at Kachidoki Station around 9:30am and hop on your comfortable and easy-to-ride bicycle to explore the Shitamachi area of Tokyo. Experience the traditional atmosphere of Shitamachi, where commoners lived during the Edo era. Here, you will find historical buildings between high-rise condominiums and modern landmarks as you pedal around with your guide and small group. Visit Fukagawa-fudo Temple and Tomioka Hachimangu Shrine, a Buddhist temple and Shinto shrine that the locals frequent. Follow your guide on a bike ride through the Kiyosumi Japanese Garden, following a path around the large pond where turtles and koi swim amid beautiful boulders, and view the bridge that connects three small islands. When you reach Ryogoku Sumo Stadium, where Japan's famous sumo tournaments take place, keep an eye out for sumo wrestlers walking around outside. Enjoy a lunch break around 12:30pm, stopping at a local restaurant where you can purchase lunch (own expense). 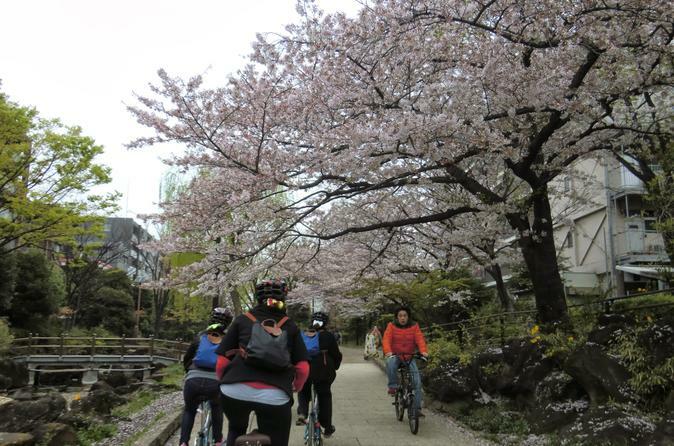 Afterward, climb back on your bike and explore Yoko-jukken-gawa park. Your Tokyo bike tour ends at the base of Tokyo Skytree around 3:30pm. Your guide will either direct you to nearby Asakusa or point you in the direction of your next destination, or you can stay to shop for souvenirs at the Soramachi shopping mall on your own. If you want, head up to the Skytree Observatory inside the 2,080-foot (634-meter) landmark for outstanding views of the city (own expense).